The Jigawa State Police command has arrested a man identified as Iliyasu Sale, for allegedly beating his neighbour, Muhammad Ubale, to death. 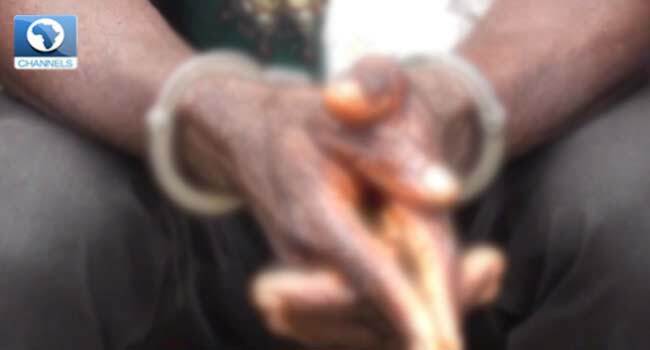 The Police Public Relations office in the state, Audu Jinjiri, told journalists on Wednesday that Iliyasu, with the help of his biological son Dotti Sale, beat the neighbour to death and threw the dead body inside a well to conceal the crime. Iliyasu after committing the crime fled to Benin city alongside his son. He later returned after two months believing the crime would have been forgotten. He was however arrested by the police upon his return. His son who is an accomplice is still on the run. Iliyasu while he was paraded by the police on Wednesday said the neigbour invaded his ranch on the fateful day and began to beat him. “I began to beat him back and was able to overpower him. Then we dumped his corpse inside the well,” he said. Jinjiri disclosed that Iliyasu was arrested alongside some suspects accused of stealing motorcycle and five other suspected buglers.